Expressions Vinyl is a vinyl distribution company that supplies affordable vinyl cutters and vinyl for fun crafts and DIY projects. 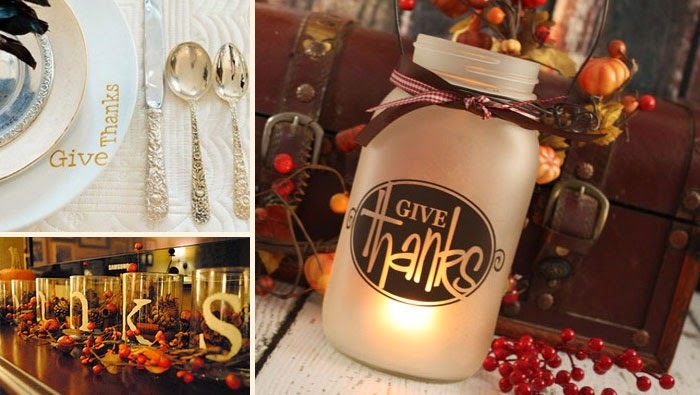 We wanted to inspire some DIY Thanksgiving projects. We love DIY projects even if it's not with vinyl. Happy Thanksgiving! Fall is here and so is Thanksgiving! My kids keep asking if they can set up Christmas decorations and get presents. I laugh and tell them not until we give thanks for the wonderful things we have. I think it will help emphasize the Thanksgiving holiday as we go about setting up decorations. So of course my first thoughts are asking how I can make some fun decorations that will involve the kids… or not ;-) So here are some great vinyl Thanksgiving decoration ideas that are simple and the kids will enjoy. It’s fun to have some color and a variety of phrases that get you thinking of what you are grateful for. With a simple, yet fun word cloud of thanks you can create an easy way to help the kids remember why we give thanks. As much as I would love to say you could use the extra pumpkins from last month (October), I am not sure how well they will hold up. However, just after Halloween there is going to be some good deals on pumpkins real or fake. Paint them white or any color and use the vinyl for the letters. It’s a fun way to bring in the fall season. This is really simple, however the garland makes it pop. By simply using some clean glasses from the dollar store and either painting or using vinyl letters to create a simple phrase. Want to impress the in-laws or friends? Gold vinyl on a white plate creates a beautiful and elegant contrast for the big feast. Express your creativity and passion for details with these simple touches. It’s bound to strike up a conversation. Grab the old Mason jar in the pantry and some wire from your craft box to create a simple and warming jar full of blessings. With many different ways to design your vinyl décor, this is a great solution for providing the warmth in your home that makes you feel at home. I hope you were inspired just as I was! These can be made with the Silhouette vinyl cutting machine right from home or some of these can simply be painted. Which ever you choose, we hope you enjoy making your Thanksgiving DIY projects. Happy Thanksgiving.